Below is the latest from Metro’s government relations staff on efforts to keep the federal Highway Trust Fund from going into the red; the fund supports road projects and mass transit across the United States. This has been a problem for many years but no solution seems imminent, particularly in an election year. Over the weekend, the U.S. Department of Transportation (USDOT) released their latest projection on the solvency of the federal Highway Trust Fund. 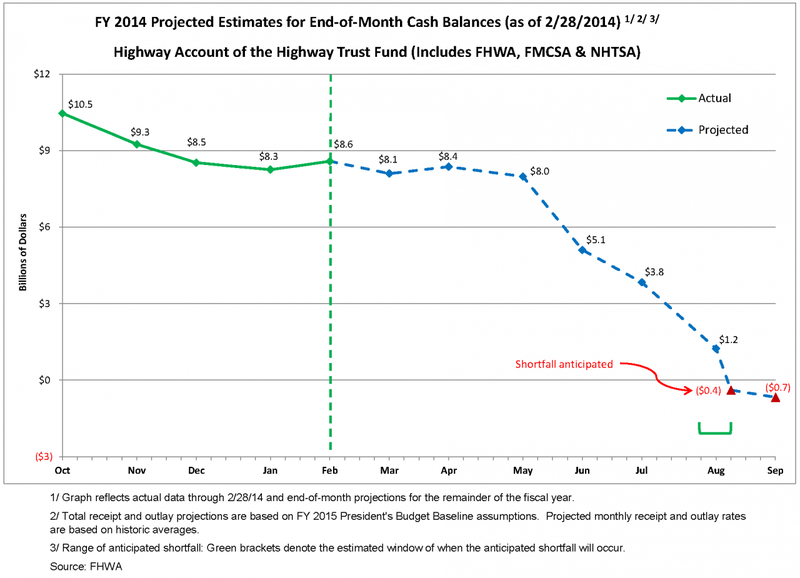 According to the USDOT, the federal Highway Trust Fund will encounter a shortfall before the end of Fiscal Year 2014. The main reason the fund has not encountered a shortfall thus far is because MAP-21, the surface transportation bill adopted by Congress in 2012, authorized the transfer of $9.7 billion from the general fund to the federal Highway Trust Fund. Congress is currently considering a number of options to address the looming shortfall. Earlier this year, our Board adopted a support position for H.R. 3636 (Blumenauer) that would keep the federal Highway Trust Fund solvent by increasing the federal gas tax by 15 cents over three years and thereafter indexing the gas tax for inflation. For a link to the USDOT report on the federal Highway Trust Fund’s finances, please click here. Time for a fossil fuel tax on all vehicles sold in the US. Hybrids cars should be taxed based on the amount of fossil fuel it is estimated to use yearly for the life of the car. How do you slap a fuel tax on electric vehicles that uses the roads as all the other gasoline powered vehicles? Should motorcycles be subject to the same rate as a 18 wheeler? Should a Honda Civic be the same rate as a Hummer? Concerning electric vehicles. How much does it cost to generate the electricity to charge them up. Is it truly cheaper or just a false alternative to purchasing gas or diesel? We don’t need a increase of 15 cents per gallon, gas is already to expensive in part because of federal regulations which drives up the price. Instead curtail these unneeded projects created it seems to just put people back to work(make work). An example is the new interchange from the N.B. 170 to the N.B. 5. They built a new transition road, tore out the old one and are now rebuilding it. And as much as the valley folks think they deserve a 70 mph freeway during rush hour, the numerous widening projects on the 405 were not really needed. All the while those who use the Hollywood Freeway into downtown still have the four only lanes as designed in the 1940’s. So under Obama we had a multitude of “make work” unneeded project throughout the U.S. and now that all the money has been squandered they want to raise taxes. The gas tax either needs to be tied to inflation, or needs to be calculated as a percentage or the price of gas (like a sales tax). The fact that it has been the same amount per gallon since 1993 is insane. Lots of if’s and unknowns. What is the current rate to use a commercial charging station and how convenient are they to use? Where I live in a condominium we have no charging stations and are not talking about them in the complex. Every parking space is deeded and the expense of retro fitting 40 plus spaces are prohibitive and possibly impossible due to the fact the entire complex may have to be re-wired to accommodate the added electrical use. Our current electric bill is $3500. per month, who pays for the increase? Is it really that hard for you to use Google? A simple Google search using the terms “electric vehicles apartments condos” refer to a new legislation called SB 880 signed by Gov. Brown on Feb 29, 2012 which refers to every single question you asked. When you have a question, ask Google. Stop living in the mindset that “not everything on the internet is true.” Google is able to give you everything from state enacted laws to concerns that everyone has and you can make your own judgment based on these results. Did you read the entire legislation or just the part you agreed with? If a condo could find a common area to install said charging station or install it in their deeded parking space it would be up to the homeowner to pay for the installation, maintenance of the charging station, one million dollar insurance policy, pay for additional electrical lines and meter and pay for the electricity used. to name a few. Kind of makes the purchase of a all electric vehicle not that desirable. I’ll stick with any of my three full size vehicles that I can drive anywhere in the United States without worrying about charging a expensive battery every sixty miles.